Balsamic vinegar’s manufacturing process depends heavily on the type of balsamic as mentioned in the previous post. While almost all varieties use wine vinegar, even the presence of grape must is not a given with generic balsamic vinegar or balsamic condiments. We will explain the production of each from the most to least expensive. This balsamic vinegar is the stereotypical “slow process” produced vinegar. 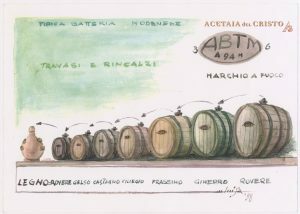 Produced only entirely in the regions of Modena and Reggio Emilia, TBV is made only from grape must, fermented over decades to vinegar. Regarding the grape must, traditionally grapes of the Trebbiano and Lambrusco varieties are used. Grape must is created by taking grape juice and concentrating it, through evaporation or other methods, to a thick, sugary syrup called grape must, or cotto mosto. This grape must can then be cooked to carmelize it some to add texture or flavor. The grape must, cooked or uncooked, is then transferred to a large special barrel called the badessa where it undergoes alcoholic and acetic acid fermentation over several weeks or months. After the grape must has become vinegar and attained the right acidity, it is transferred from the badessa to the first barrel of the batteria. A batteria is a sequence of 5-7 sequentially smaller wooden barrels used for aging. Each barrel is typically made of a different wood to impart flavor. For example the sequence of woods in the barrels could be oak, chestnut, cherry, juniper, mulberry, and acacia. The new vinegar is placed in the first barrel which is filled almost to the brim. 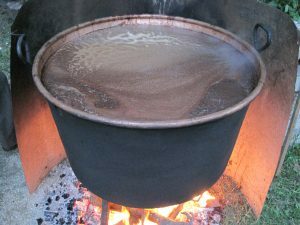 There is a hole on the top of the barrel for air circulation which is covered by a cloth fixed in place by a piece of wood, or more traditionally, a river stone. Over the years, part of the contents of each barrel are transferred to the next smaller barrel while newer vinegar takes its place in the previous barrel. After the aging is completed, vinegar is taken from the smallest barrel and bottled for sale. This aging process takes at least 12 years (or 2 years per barrel on average) and requires a large amount of vinegar in various stages of production for even modest annual sales. The final step in traditional balsamic vinegar making is an official panel that judges the sensory and taste aspects of each lot of vinegar produced by each acetaia that wants to use the PDO designation. The vinegar is then assigned a category based on quality that is used for pricing. For TBV of Modena there are two quality categories and for TBV of Reggio Emilia there are three categories. 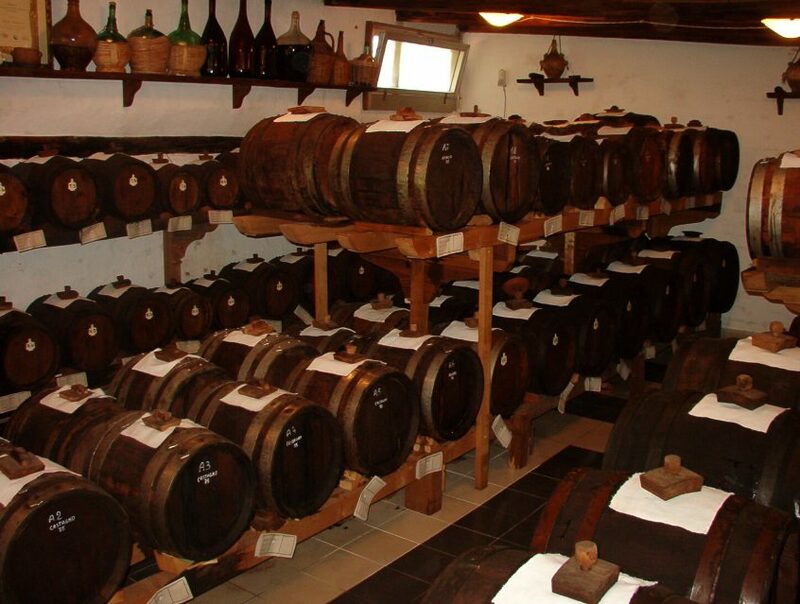 Balsamic vinegar of Modena (BVM), by far the largest by volume, has a less complicated and more rapid process leading to higher production volumes and cost savings. Unlike TBV, BVM can use a mix of wine vinegar with added grape must to make balsamic vinegar. Since the acidity must be 6%, typically BVM starts with wine vinegar between 8-12% acidity with grape must added directly for the correct texture and flavoring while maintaining acidity. In addition, up to 2% caramel can be added based on taste, texture, and cost considerations. Typically for BVM, wine vinegar is produced with modern, high volume processes from relatively cheap grape wine stock. This is mixed with mass produced grape must and caramel to get the right flavor. The final step, aging, is only done in one tank or barrel. The minimum time is 60 days with “aged” vinegar being three years. In honesty, the 60 day aging is not that much different from other vinegar production processes worldwide so only adds a minimum of flavor though it can improve flavoring if oak barrels are used rather than steel tanks. Generic balsamic vinegar and vinegar condiments have the cheapest and least complex production processes. They also have huge leeway with ingredients. General balsamic vinegar will use wine vinegar as a base, just like BVM, and for texture and flavor they often use caramel but in higher quantities than BVM. Generic balsamic vinegars also have no aging requirements. Balsamic condiment ingredients are even looser and are not limited to either grape must or caramel and often use other sweeteners like glucose syrup (from any source like sugar beets) or thickeners like corn starch or xantham gum. Grape must volume can be very limited and there is no legal requirement. The rise of balsamic vinegar has made some of its varieties extremely valuable. There is not a large and liquid market for expensive vinegar similar to the global market for fine wine. Wine is widely traded and stored as an asset class and even tracked by its own market index, the Liv-Ex. However, some types of aged traditional balsamic vinegar have sold for substantial sums. In 2007, at the first International Auction of Balsamic Vinegar in Modena, a 100mL bottle (Traditional Balsamic Vinegar of Modena, unknown aging) was sold for 1,800 Euros (about $2,500 at the exchange rate then). This would make this vinegar cost about $25,000 per liter or almost $95,000 per gallon! At the same auction, a nine barrel batteria of aged balsamic vinegar sold for 31,000 Euros (about $43,000). Three other family batches of balsamic vinegar were purchased by Chinese chefs from Shanghai demonstrating the global pull balsamic has obtained. Of course these are extreme cases but traditional balsamic vinegar of substantial aging frequently is sold between $50 – $250 for 100 mL to 250 mL bottles. However, the cheapest balsamic vinegar, the IGP designation balsamic vinegar of Modena, has taken the supermarkets of the world by storm retailing under $10. It is commonly found by brands such as Colavita or Alessi but also increasingly common as private label store brands. In addition, instead of bottling in Italy, balsamic vinegar is being increasingly exported in 24,000 liter Flexitanks (giant plastic bladders), just like wine imports, so that companies in the importer country can bottle and private label as they see fit with no repackaging. Along with the rise in popularity of olive oils, many shops selling flavored olive oils and balsamic vinegars, such as “Oil & Vinegar” or “F. Oliver’s” have opened catering to adventurous lovers of oil and vinegar. Oil & Vinegar stores, all local franchises, take advantage of scale having the Dutch parent company, Assisi BV ship in bulk and assist in distribution in the USA. Unfortunately, with such popularity and high pricing comes adulteration and fraud. Many manufacturers will use white vinegar or even industrial acetic acid colored with caramel or cane syrup to make a cheap ‘balsamic’. In addition, the relatively high margins of balsamic vinegar have attracted organized crime syndicates across Europe which use cheap vinegar, or even synthetic acetic acid, colored and flavored with substances like caramel to sell fake balsamic vinegar to unwitting customers. To combat fraud in vinegar, new modern techniques have been developed to essentially “fingerprint” regional vinegar varieties and look for the presence (or absence) of certain chemical compounds to determine whether vinegar is authentic. The company Eurofins, founded by a French scientist father & son team, has developed an extensive database of analyses of PDO and IGP vinegars from around Europe and the rest of the world. While no batch of vinegar is identical, by creating a general fingerprint of the vinegar varieties based on grapes, flavor chemicals produced in aging, and the presence of adulterants, vinegar samples can now be sent for fraud analysis and unscrupulous companies can be ejected from the supply chain.